Salmon with cucumber are a classic combination that sometimes gets overlooked, possibly because you see it most in the cooking of Scandinavia and Eastern Europe. That’s basically where I got the inspiration for this recipe, in a great book of Austrian cooking by Chef Kurt Gutenbrunner called Neue Cuisine: The Elegant Tastes of Vienna: Recipes from Cafe Sabarsky, Wallse, and Blaue Gans. Wherever cucumber goes it cools the food it hangs out with. 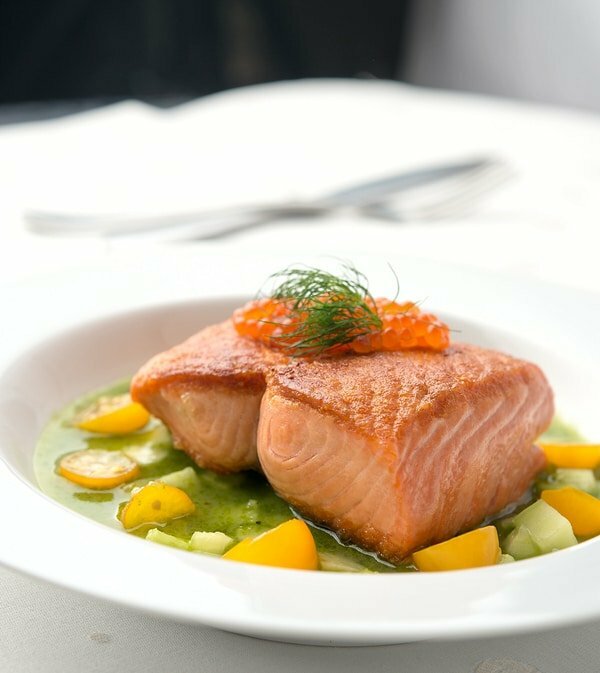 In the case of salmon, cucumber tames a lot of the richness and punch of good wild fish, which has way more depth of flavor than the farmed Atlantic stuff. This is especially so with kings and sockeyes, which are the most assertive of all salmon. I cook almost exclusively with king salmon because that’s what I catch here in California, but any salmon will work here… even farmed Atlantic. Gutenbrunner’s original recipe calls for halibut and doesn’t have any tomatoes in it, and his sauce is a bit more complicated. But even slimmed down this is a date-night dish, not a Wednesday night special. That’s not to say it’s overly tough to make, but it does require a couple hours of passive time to let the cucumbers and dill strain slowly. Incidentally, both of these steps (detailed below) can be done ahead, making the dish come together quickly when everything’s set. 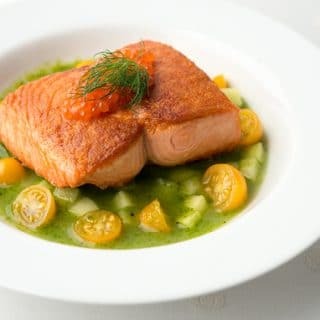 The salmon is simply seared in a hot pan until you get a crispy crust on one side, then served with a delicate onion-cucumber-dill sauce that has chunks of cucumber and little cherry tomatoes in it, and it’s all garnished with white pepper, more dill and salmon caviar. You don’t strictly need the salmon caviar here, but when the caviar is well made, the flavor is almost identical to chicken egg yolks and that touch really does add something to the overall dish. If you don’t like caviar, go ahead and skip it. And as pretty as the final dish is, it’s even better to eat. 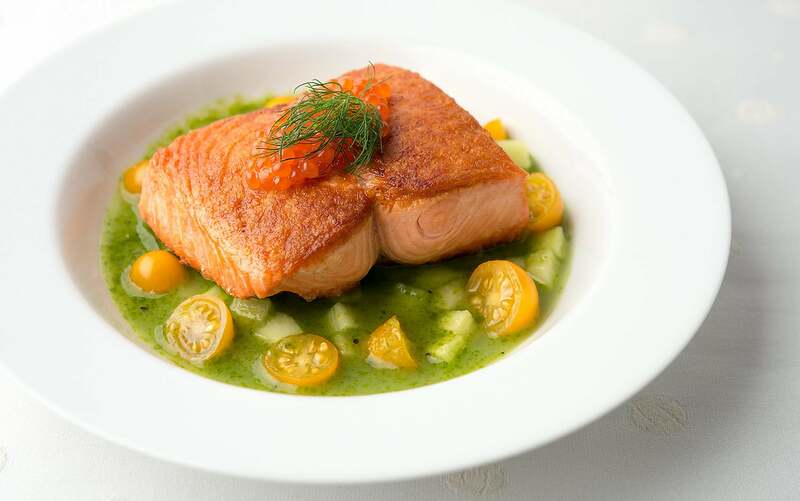 You have all sorts of different flavors and textures going on — crunchy crust and then the silky interior of the salmon, a cooling, mellow sauce, the bright zip of the cherry tomatoes, that über-rich salmon caviar. If you make this for guests and they’re not blown away, find new guests. There's more to this plate of food than might at first seem. The salmon is really simply cooked, but the sauce is kinda involved. Do this for a nice weekend dinner, a date, or something for a summer or early fall celebration. If you make this in winter with hothouse cucumbers, omit the tomatoes altogether -- better to skip them than use crappy out-of-season tomatoes. I catch a lot of king salmon, so that's what I use. Feel free to use smaller pieces of salmon, or substitute any other sort of salmon, trout or char. Don't like salmon? Try halibut. You do want a thick piece of fish here, though, so just keep that in mind. To make the dill oil, put the oil and dill in a blender and puree for a solid minute on high. Set some cheesecloth in a fine-meshed strainer and put the strainer over a bowl. Pour the oil into the strainer and put the whole thing into the fridge to slowly drip. (Keeping it in the fridge helps preserve the bright green color.) This step can be done up to 3 days in advance. Salt the salmon pieces and put in the fridge. Gently cook the onion in the walnut oil until it is soft and translucent: I do this over medium-low heat in a covered pan. Don't let the onions brown. When they are cooked, puree them in a blender and set them aside. Slice each cucumber lengthwise. Use a spoon to scrape out all the seeds from both cukes; don't toss the seeds. Chop the unpeeled cucumber and put it and the seeds into a blender. Puree. Set a fine-meshed strainer over a bowl and pour the pureed cucumber into it. Let this strain untouched for 2 hours. Meanwhile, dice the peeled cucumber. To make the sauce, whisk as much of the strained cucumber water into the pureed onions as you need to make a sauce the consistency of melted ice cream. Add 2 tablespoons of the dill oil (save the rest for another dish) and season the sauce with lemon juice, salt and white pepper to taste. I like this served at room temperature, but you could warm it gently, too. Don't heat it too much or it will break and taste weird. To cook the salmon, heat the oil in a pan over high heat until it's almost smoking. Pat the salmon dry with paper towels and set it into the pan. Sear one side of the salmon hard for a good 6 to 8 minutes. Don't let it burn, but you want a good crust. If the salmon is very thick, you will need to flip the fish and finish cooking on the other side. If it's an inch thick or less, you can just baste the exposed side of the fish with the hot oil and it will cook fine. To serve, toss the diced cucumber and the cherry tomatoes in the sauce and pour some in shallow bowls or plates with a well in the center. Set the salmon on top seared side up. Top with a little more dill and some salmon caviar, if you have some. I like to eat this with a bracing white wine like a Chenin blanc or a French Sancerre. A German Riesling or an Italian Pinot Grigio would be good, too. For beer, go with a hefeweizen or a good lager. Made a close variation tonight. I didn’t have any dill, so I made a basil oil. That worked, too. The cucumber sauce alone would make a great cold soup for hot summer days. I will be making this again! This dish was fantastic! Easy to make and delicious! We’re going to try the sauces again with a bit stronger fish than salmon (perhaps a tuna), as the sauces slightly overpowered the tuna we had (not great options out here on the East coast for salmon).